Learn To Grow Orchids Easily In Growing Orchids For Beginners! Yes, growing orchids for beginners can be very easy. Once you learn about the about the advantages of orchids you will see that they are like any other house plants, they need water, light, fertilizer and, oh yes, you should talk to them or even play them some music. One of the long standing myths that I still hear is that growing orchids as house plants is difficult and that orchids are finicky to grow. Well, plain and simple, the answer is NO. In fact, orchids as house plants are easy to grow and will continue to bloom for years. Some orchid plants have been around for centuries! Below are some highlights you can use as a guide to growing orchids for beginners. As a beginner (and having a "beginner's mind" as they say is a wonderful thing!) you can learn a little about orchid anatomy. Frequently people write me and ask me to recommend resources or sources of information to learn about orchids. Currently I am just finishing up writing an e-book, How To Care For Orchids. I am expecting to have it finished and available for purchase by July 2013. I own about 20 hard orchid books and over 5 orchid e-books. I like different books for different reasons. I have enjoyed writing this book and sharing my many years of orchid growing knowledge. So stay turned. This would be the book to start with right now whether you are a new orchid grower or have some experience. Choosing an orchid for the first time can be daunting. These pages can give you some information to help you learn how to choose an orchid that is right for your circumstances and the environment that you can provide. When you choose an orchid it is important to pay attention to the place you purchase the orchid. It is important to be choosy when acquiring orchids from places that have large quantities of orchids. 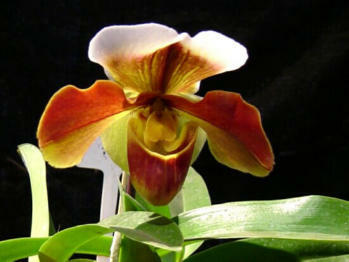 The high supply of orchids does not necessarily mean that they will be the best. On the contary it is better to purchase from known reputable orchid growers rather than the cheaper big box type stores. Here is a list of other important factors to consider when growing orchids for beginners. One of the two top items in growing orchids for beginners is Water. The other is Light. 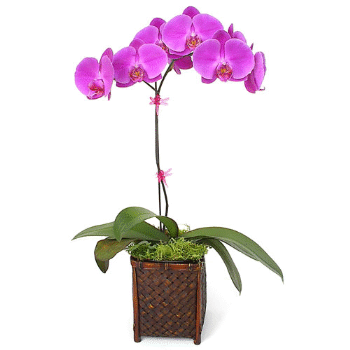 Orchid house plants and orchid plants in general will need watering periodically, usually you can water once a week. Remember, most orchids are air plants and this means you will see their roots. Their root system and the pseudbulbs are very efficient in storing water. Here is a watering guide you can use: Cattleya, Oncidium and Dendrobium orchids like to dry out between watering. An easy way to water is to put the plant in the sink and let water flow through the plant for about 20-30 seconds. Remember, let the water drain from the plant before putting it back into the decorative pot. Phalaenopsis orchids like to almost dry out between watering. To decide on the next watering is to stick your finger about or a wooden pencil an inch into the medium which should feel spongy and not bone dry. Growing orchids like Paphiopedilum and Epidendrum should be slightly moist so that watering can be twice a week. If the humidity in your home is low(below 40%) you may need to either mist the plant occasionally or use a humidity tray. The tray is simply a metal or plastic tray that is filled with pebbles and 1/2 of water. The plant would sit would sit on the pebbles. Be sure not to let the plant or roots sit in the water while on the tray. Check out the page on humidity trays for a very cool way to handle humidity for your orchids. Check out These Cool Orchid Growing Humidity Trays for a very easy way to handle humidity for your Orchids! Growing orchids for beginners requires the right light. It is the next most important element to growing orchid plants. As a general statement most orchid house plants do well in medium light. This would in a window or an area that could get about 4 hours of sun or bright light a day. Cattleya orchids do well in this light but can also do well in a sunlit area for up to six hours. Phals. do well in indirect but bright light. Most orchids do well in normal house temperature. The low temperature at night do not impede the growth. Here is a little guide you can use. Growing orchids for beginners should understand that there needs to be fluctuation in temperatures in order for the plants to bloom. For example, there should be about 10 degree fluctuation for Cattleyas between the day and night temps. So, hopefully this is a good start for you for growing orchids for beginners. If this is of interest then go to the Frequently Asked Questions page. There I have written answers to the most Frequently Asked Questions. There is lots of great free information there for new and not so new orchid growers. And OK, for those of my readers who would rather have a good old fashioned paper book than an e-book I can heartly recommend this book called "Easy Orchids: Simple Secrets for Glorious Gardens - Infoors and Out" by Mimi Luebbermann. This book has fabulous photography by Faith Echtermeyer. I have owned this book since 1996 when it was published. I love it and I think it is a great book for someone just getting interested in orchids, for growing orchids for beginners. Or if you just want a little sampling of orchid information try this basic orchid course.